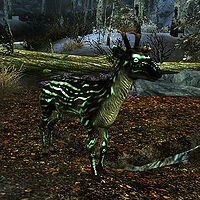 Similar to normal deer, vale deer are only found in the Forgotten Vale. 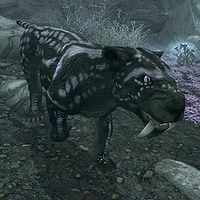 They have a unique greenish glow in their eyes and hide until death. A vampire is a preternatural being, commonly believed to be a reanimated corpse, which consumes the blood of sleeping persons at night, thralls, and other victims. 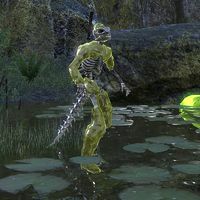 The vampires of Tamriel are undead, diseased persons who are hated, hunted, and misunderstood by the living. Whether they consider themselves cursed or blessed, or whether they have given into their animalistic instincts or have sought to rid the world of the disease, vampires are nonetheless considered abominations. Though it's possible for a vampire to find a cure, knowledge of how to do so has been suppressed in many places due to the fear that it would encourage people to deliberately infect themselves. The vampire is one of the most powerful and feared of all the undead. While they are typically incredibly fast, gifted mages, and unnaturally strong, fear of vampires is abnormally great due to their ability to infect others, a fate often described as worse than death. Distrust and chaos can potentially bring down entire settlements should just one vampire infiltrate the populace. Vampires spread by giving mortals diseases such as Porphyric Hemophilia, Sanguinare Vampiris, and Noxiphilic Sanguivoria. 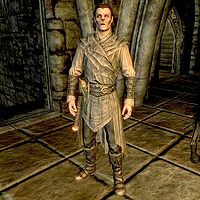 Vampires tend to be organized into many different clans; in fact, there are over a hundred distinct kinds of vampire in Tamriel. The Vampire Lord is a powerful type of vampire, being much closer to being pure-blooded, although they do not necessarily have to be. Vampire Lords are tall humanoid bat-like creatures with sharp, sometimes poisonous talons and small wings. These creatures can shift between their original forms and the Vampire Lord form at will. They are also capable of using magic, and can also transform themselves into a cloud of bats to pass small distances or even mist to become temporarily invincible. 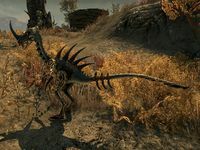 This eyeless Daedra is aggressive and mindless, and typically attacks all who approach. It is said that the Vermai have no thoughts, and therefore cannot fear. They have sometimes responded to attempts at communication, but never in any intelligible way. They have often served Mehrunes Dagon. Verminous Fabricants are construct created by Sotha Sil in his Clockwork City. 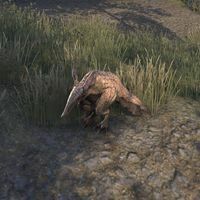 An artificial creature with synthetic legs and tail, it acts fast and agile and attacks with the large fang on its head. Its components can be safely imbibed and are potent speed potions. Voriplasms feeding on a Haj Mota. 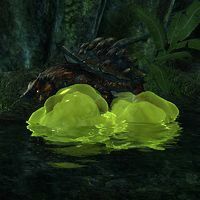 A Voriplasm is an amorphous blob of sentient green slime, mostly found in Black Marsh, that can strip creatures down to the bone within moments. Voriplasms can then envelop and puppeteer the remaining skeletal structure of their victims as a "voriplasmic corpse". A type of fish that can be found in the cold waters of the Wrothgarian Mountains. This page was last modified on 24 November 2018, at 09:01.